Oakbrook Center first opened its doors in 1962 and quickly became a regional shopping destination for the Chicago metropolitan area. The mall, located in a first ring suburb of Chicago called Oak Brook, offered a unique shopping experience in an outdoor, open-air environment. Original designs for the mall played on this idea by conceptualizing the mall as a garden, with water features within the garden a primary component of the experience of the place. Oakbrook is the second-largest retail destination in the Chicago area, so it was an easy decision for Chicago-based development company General Growth Properties to invest in the redesign of the shopping center. In 2011, GGP engaged Omniplan Architects and Studio Outside in that task: to take the strong points of the existing shopping center and re-envision them through total renovation of the exterior space. The studio team used an elegant palette of materials to revitalize and upgrade the aging facility while using many of the existing large specimen trees as focal points of the landscape design. The largest task that faced the design team was to re-imagine the shopping center’s well-known water features. 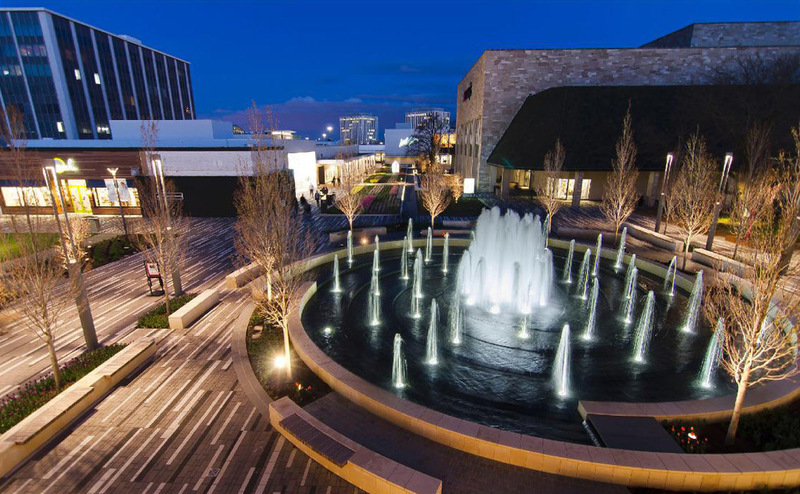 Studio Outside began the large task by conceptualizing 5 new fountains which would run year-round for the mall. Fountain Source, a California-based fountain design firm, helped the team understand the powthe intricacies of water technology and engineering. At the heart of the mall is perhaps the renovation project’s most celebrated amenity, the Vortex Fountain. The large, central fountain consists of a series of concentric spirals that work in harmony with water jets, lighting, and seating to create an incredible public space and focal point for the entire project. A large, central fountain had always existed in its space, but it’s tired 1960’s design was one-dimensional and did not excite shoppers. The owner challenged the designers to create a fountain that was visually dynamic while also discouraging shoppers from directly entering the space. To do this, the fountain’s form created a space, as opposed to simply acting as an object in space. The design team sought to minimize the edge of the fountain in order to marge the fountain into the surrounding plaza space. The edge was given multiple functions; it acts as a seat wall, a planter wall, and a water container. Instead of being continuous, the wall is made up of many segments spiraling around each other. This makes it hard to define where it begins and where it ends. At its lowest point, the fountain is only 18” deep and spirals down to this point from the elevation of the plaza surrounding it. The sculptural water feature plays a significant role in the visitor’s experience of the fountain. Fountain Source created very dynamic water sequencing to engage visitors. Vertical jets emphasize the spiraling form of the fountain and draw the visitor’s eye down to a large central array, a composition pulsing with over 4,000 gallons of water per minute. This is enough volume to fill a typical backyard swimming pool in less than five minutes. What a visitor will never see is the impressive pump and computer system built by Illinois-based fountain contractor Fountain Technologies and General Contractor Graycor Construction. Together, the team was able to design, engineer, and build the system that runs the fountain including: a 40,000 gallon water tank (located in the basement of the mall building next to the fountain), a highly sophisticated computer panel, over 50 Crystal Fountain nozzles and LED lights, 7 pumps, and an elaborate network of piping. Below the fountain: two layers of an elaborate network of piping. Concrete reinforcing shows where the concrete will be formed to create the concentric spirals of the Vortex walls. Pipes stub up where weirs are located that deliver water to the fountain. Massive concrete formwork in place while concrete is poured to form the fountain. The concrete basin is cured. A dozen ornamental trees are planted in perimeter planters along the fountain walls. To the side of the planters are the weirs that supply water to the fountain. Pipe connections for the jets are stubbed up. In the middle, the piping to deliver water to the center array of jets. A layer of black water-proofing membrane covers the concrete fountain basin- which will evenutally be covered with stone pavers. Stone masons work on cladding outter foutain walls with limestone. The fountain system's mechanical panels and computer. Massive supply and drainage pipes to take water into and out of the pump room. To the right: The fountains 40,000 gallon water tank. Pumps that feed water to the fountains jets, and supply weirs located just outside of the water tank. Video: Little Free Libraries in Dallas! bcWORKSHOP, organizer of the Little Free Libraries project in Dallas, just released a great video of the build day activities last weekend. Check out the Studio Outside library in Mill City and other really cool projects all around Dallas!